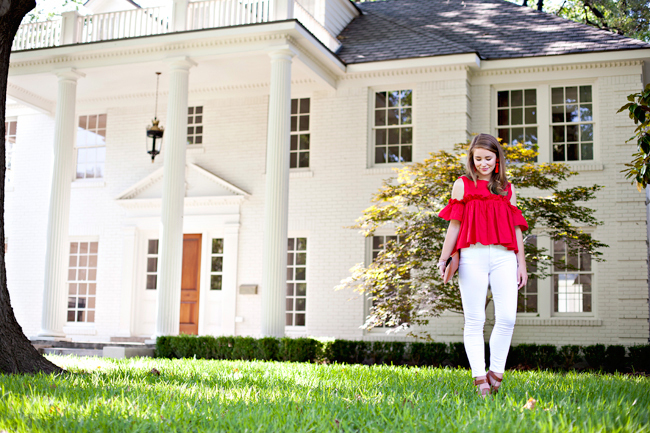 I’ve started to notice that I have an addiction growing… to all things red, that is! Whenever color options are available, in the past I’ve almost always gone with white. The most versatile choice, the most practical choice, that sort of thing. But a flip has switched, and now red is the first shade I reach for. 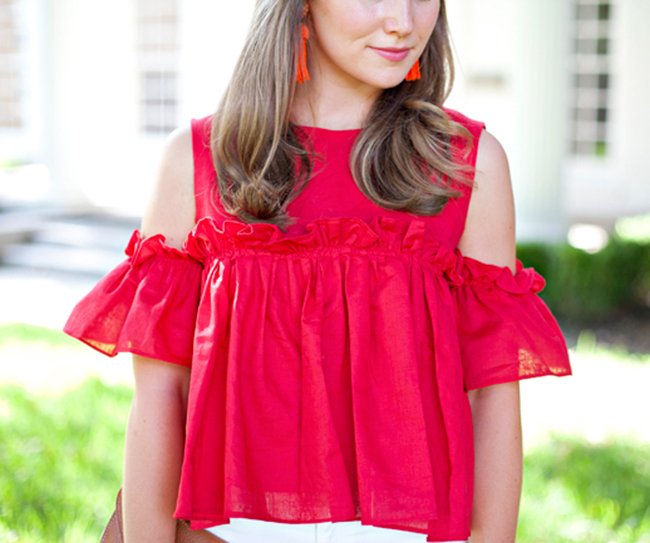 So in coming across this top, the fun ruffles and shoulder detailing already had me sold, but the cherry on top was the gorgeous red hue! I snatched it up from Pixie Market, and as I’ve talked about before, their pieces sell out incredibly fast. 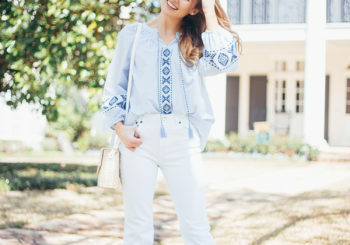 While this exact top isn’t available anymore, the good news is I’ve found one here that has the same flirty cut in the same jaw-dropping color. Hip hip, hooray! One last shout out to the color red… it’s a shade that works now and will continue to all the way through winter! 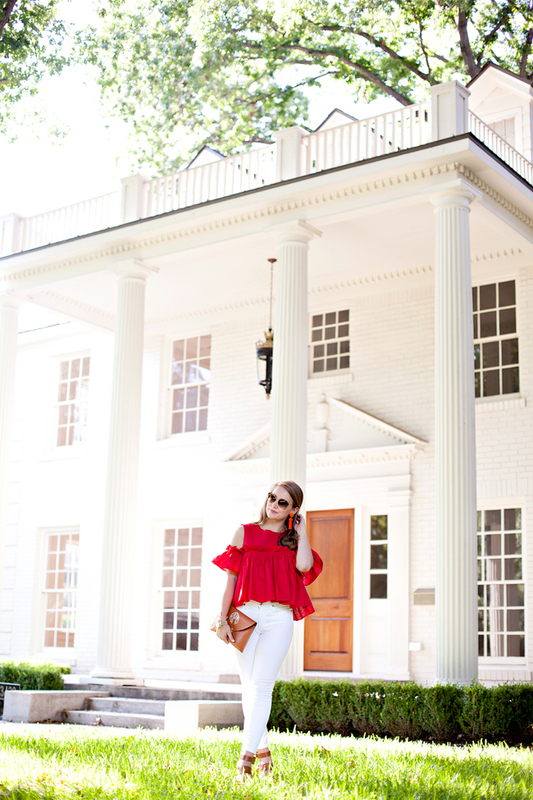 While this top in white would be too summery for October, the red will be perfect dark denim and riding boots (did you see the new ones I debuted on Insta yesterday?) or these suede heels. 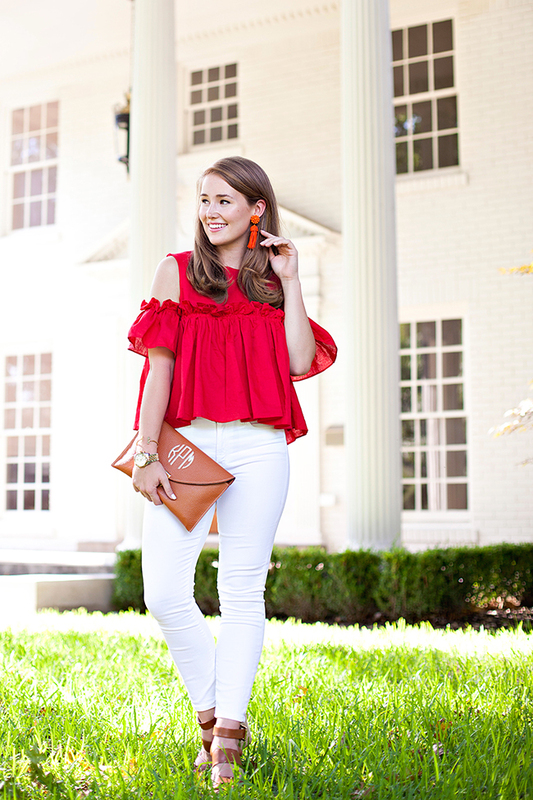 Be on the lookout for fun red pops you can add into your own wardrobe… whether it’s a statement blouse like the one above, a poppy cross body (like my new baby!) or even a go-to red lip. Even the smallest touch will put a swing in your swagger, trust me! And yes… I did just make up swing in your swagger. Make fun all you want, but I kinda dig it. P.S. LADIES! 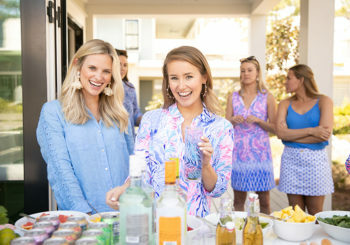 One of the best sale days of the year is here… the Lilly Pulitzer After Party Sale! It goes live today at 8am ET so RUN, don’t walk, because the best goodies sell out way quick! While you’re waiting in line, you can see all of the dresses on sale HERE. Write down your favorites so that when you get access to the sale, you can type the names into the search bar instead of scrolling through pages. Good luck! Love the red! I’ve been looking for a cute red top for a while now. That shirt is adorable! Bright colors are definitely your “thing” – they look amazing on you! I love those shoes too! What a darling top! I love the fun details and the red looks amazing on you! I’m also obsessed with your new Tory riding boots!! Pretty top!! 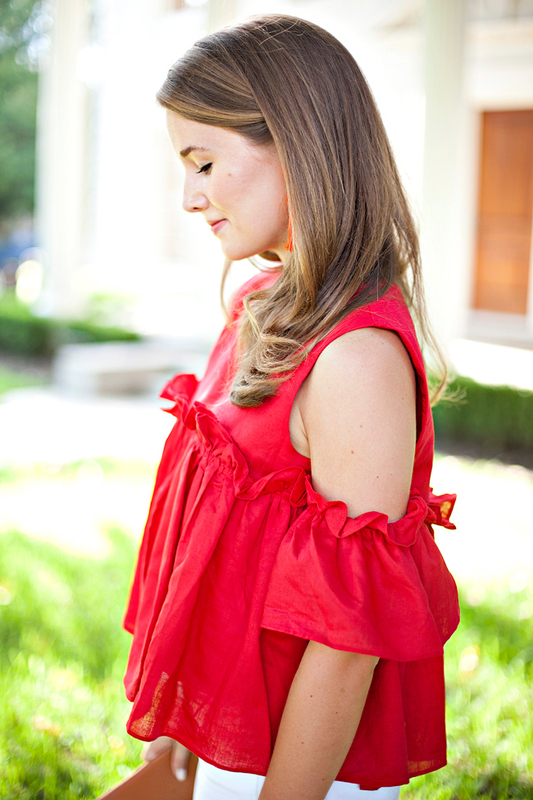 I love all the ruffles! 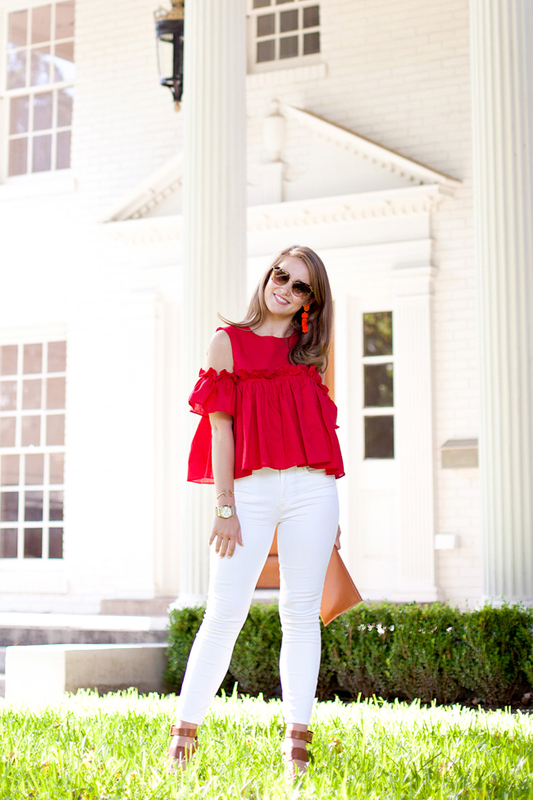 You totally put a modern spin on Antebellum ruffles! :) This look is too cute and the setting is gorgeous! 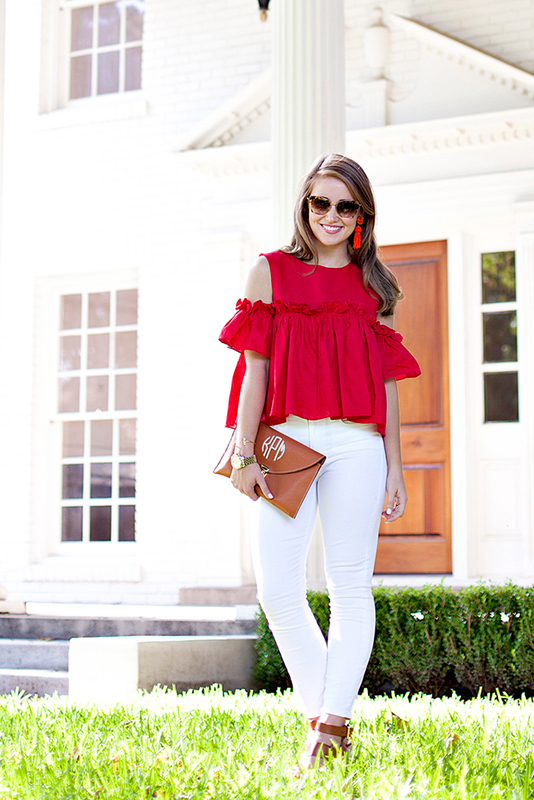 LOVE the red and the ruffles! The outfit perfectly matches the background. Gorgeous as always! great blog. girly. btw cute outfit. love the color red.